​Forget those stabilisers and get pedalling whilst having fun and learning skills along the way with our learn to ride sessions. 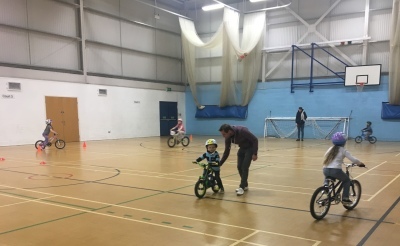 Our Biking Buddies 4 week courses have a maximum of 10 riders age 4+ in the sessions with lots of members of staff to make sure your child gets plenty of attention. Each session is full of games and activities as well as some individual attention. Riders leave our learn to ride sessions with great confidence, safety knowledge and skill. 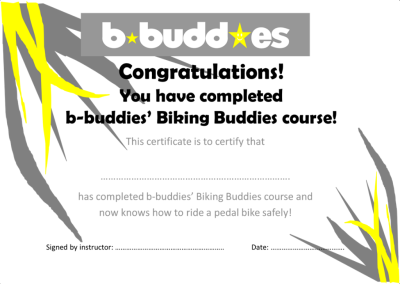 b-buddies' Biking Buddies course. This is a great reward for them and a chance to relect on how far they have come from the beginning of the 4 weeks. We very rarely have children that are unable to ride by the end of the course. We do not provide bikes for the sessions however we do have some hire bikes and helmets that can be used if arranged before hand. Riders should be able to reach the floor with flat feet and slightly bent knees. Sometimes hands start to ache or feel sore due to gripping the handlebars for so long therefore gloves can be a good idea to bring if you wish. Helmets must be worn at all times during the session for insurance purposes. ​Kingfisher Road, Mountsorrel, LE12 7FG.